We are excited to announce the second annual Three Rivers Evolution Event (TREE), a regional conference serving Western Pennsylvania and the surrounding areas, sponsored in part by SMBE. TREE aims to bring together researchers to share and discuss all aspects of evolutionary biology in a diverse, exciting, and accessible environment. Last year, 168 attendees from 38 different institutions joined us in our shared passion for evolution, and we expect our community to grow even larger in 2018. This year’s keynote address will be delivered by Dr. L Lacey Knowles of the University of Michigan. Researchers of all stages and institutional affiliations are welcome to present. The deadline for both registration and abstract submission is July 31st. 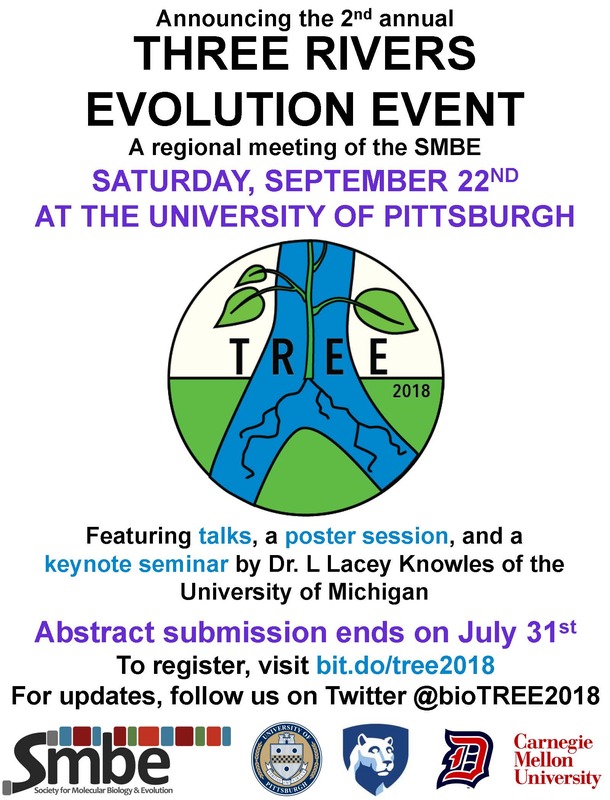 To register and/or submit an abstract for a talk or poster, please see our website: https://sites.google.com/view/treepgh There is no fee for registration.